Born on Good Friday 15th April 1949 and my only claim to fame is that I share the same birthday as Leonardo da Vinci. My father, grandfather, etc were coal miners and it was inevitable that when I left school at 15 I went to work down the mine. This was in South Yorkshire and later Nottinghamshire. After 14 years (10 on the coalface) I left to become a mine lecturer at Worksop College. Following this I went to live and work in the Power Industry South Africa and later back in the UK with National Power. I started painting at 19 after an injury at work left me at home for a couple of weeks. My first painting of a horse turned out to be a donkey despite all my efforts and I nearly gave up. My father encouraged me to keep trying so eventually painting became part of my life. In South Africa I joined the Krugersdorp Railway Preservation Society and painted a picture of a locomotive to raise funds for them. Occasionally I was asked to do some drawings for the magazine. Also, being in S. Africa I became interested in the wildlife and the beautiful scenery. Returning to the UK in 1988 I joined National Power as an engineer and was made redundant in 1999. I set up my own business as a therapist (reflexology/reiki) and also as an amateur artist. Currently I work part time in a Collectors shop, and paint when I can. I am a member of various art societies, including the Guild of Wiltshire Artists and the Swindon Artists Forum and the Lydiard art group. Great Western Railway Dean 3571 class seen at Brinkworth station near Chippenham, Wiltshire in the mid 1930's. 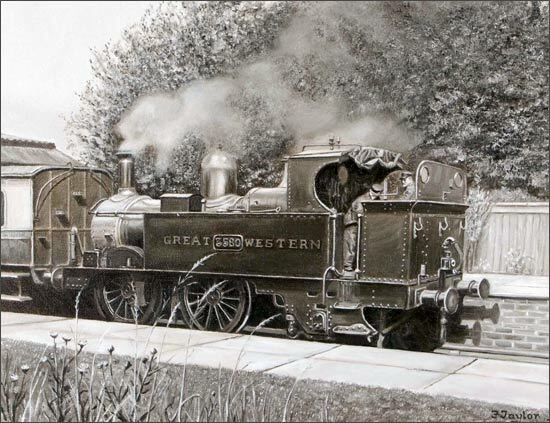 Great Western Railway King Class locomotive No. 6024 'King Edward I' at Stafford Road engine shed in Wolverhampton circa 1956. Willesden engine shed in north London in 1963. British Railways 9F freight loco number 92078 is seen about leave the yard.